We’d love your help. Let us know what’s wrong with this preview of The Crime Buff's Guide to Outlaw Washington, DC by Ron Franscell. 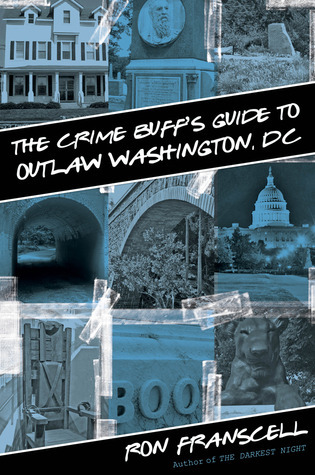 The Crime Buff's Guide to Outlaw Washington D.C. is the ultimate guide to the criminal history of our nation's capitol. It reveals the darker side of the city through riveting tales from history, photos, maps, directions, and GPS coordinates for sites to visit. To ask other readers questions about The Crime Buff's Guide to Outlaw Washington, DC, please sign up. A good, interesting read full of anecdotes of the criminal events, mayhem and general weirdness in and around the District of Columbia. I loved that he included the Bunny Man and a photo of the bridge where he hangs his victims. I puzzled over the decision to use exact GPS locations throughout, but hey, why not? This entire series is so addictive. Keep up the good work. NEW TRUE CRIME COMING IN APRIL 2019! "Alice & Gerald: A Homicidal Love Story" (Prometheus Books) explores a grisly, real-life case of murder and perverse devotion. "Alice & Gerald" features a femme fatale whose manipulative, cold-blooded character rivals Lady Macbeth, this page-turner by bestselling true-crime author Ron Franscell revisits a shocking cold case that was finally solved just w NEW TRUE CRIME COMING IN APRIL 2019! "Alice & Gerald: A Homicidal Love Story" (Prometheus Books) explores a grisly, real-life case of murder and perverse devotion. "Alice & Gerald" features a femme fatale whose manipulative, cold-blooded character rivals Lady Macbeth, this page-turner by bestselling true-crime author Ron Franscell revisits a shocking cold case that was finally solved just when the murderers thought they'd never be caught. A lifelong journalist, Ron Franscell is the bestselling author of 17 books. He is now working on his next true crime. Over the years, Ron's books have earned high praise from bestselling authors such as Ann Rule, John Lescroart, Vincent Bugliosi, C.J. Box, Howard Frank Mosher, and Warren Adler. His writing has been compared to Truman Capote, Robert Olen Butler, Norman McLean, Cormac McCarthy and Charles Frazier. Now, meet the author, who now lives in San Antonio, Texas. MORGUE: A LIFE IN DEATH (St. Martin's Press) was co-authored with acclaimed medical examiner Dr. Vincent Di Maio. It explores Di Maio's life and a dozen of his most historic, infamous, and heartbreaking cases. And THE DARKEST NIGHT (also titled FALL in a 2007 hardcover) continues to be a bestselling true crime. This intensely personal nonfiction about a monstrous crime that touched his life as a child has been hailed by authors such as Ann Rule and Vincent Bugliosi, as well as critics, as a direct literary descendant of Truman Capote's "In Cold Blood." But Ron's books aren't confined to true-crime. THE SOURTOE COCKTAIL CLUB is the true story of an extraordinary -- if slightly macabre -- road trip with his teenage son to the Yukon in search of a mummified human toe .. and a father's reassurance that he hasn't become irrelevant to his son. His CRIME BUFF'S GUIDE books are quirky travel guides that take true-crime and history-trippers to some 400 outlaw- and crime-related sites all over the USA. Editions include Los Angeles, Texas, Colorado, Arizona, New Mexico, Pennsylvania, Wyoming, Washington DC, and Maryland. His debut novel, ANGEL FIRE, was published by Laughing Owl in 1998, and reprinted by Berkley (Penguin/Putnam) in 2000. His popular mystery, THE DEADLINE, was re-published in 2014 by WildBlue Press, followed by a sequel, THE OBITUARY. His book reviews and essays are regularly published in many of America's biggest and best newspapers, such as the Washington Post, Chicago Sun-Times, San Francisco Chronicle, Denver Post, San Jose Mercury-News, St. Louis Post-Dispatch, Milwaukee Journal-Sentinel and others.